PNW has released a $150 dropper called the Ridge. We couldn’t wait to get one in and try it out. The Ridge features 125mm of drop. This may not sound like a lot but in actuality for most average sized individuals (5’8″) 125mm works pretty well. In fact on the size medium Stumpjumper we mounted the Ridge on any more drop would have been too much. The post is infinitely adjustable across the 125mm of drop. It comes with a thumb lever that is 2x compatible and all the required hardware and cables for mounting. I was immediately impressed by the packaging and the feel of the dropper itself. This does not feel like a cheap piece of equipment. The dropper is made from 6061 alloy which is one way PNW keeps the price down on this dropper compared to it’s more expensive droppers that are made out the lighter and stiffer 7075. This compromise however does not affect the fit and finish of the post at all in my opinion. Installation of The Ridge was pretty straight forward and not any more complicated than any other cable actuated dropper. This post is internally routed and we thankfully already had housing in place on our test bike so no finagling was needed that way. The cable actuation is routed with the “clean” end of the shift cable at the dropper and end and the cable stop at the lever end. The clean end gets it’s own fitting that then slots into the bottom of the dropper to facilitate operating the dropper itself. Cable tension is all adjusted at the lever end and getting a good lever feel was surprisingly easy. The Ridge has a full insertion length of 235mm which means slamming this post all the way on our size medium Stumpjumper was not an issue. Getting the saddle set up properly was easy with a standard two bolt adjustment. One small complaint is that the one adjustment bolt for the saddle is angled a bit close to the post itself so we were extra careful not to scratch it. We’ve been riding with the PNW Ridge for about a month and we’ve had nothing but good things to say about it. The action and speed are consistent and smooth at a variety of temperatures. Coming from an adjustable pressure, air charged system found in the Specialized Command post, this consistency is extremely welcome. There’s no worrying about if the post will happen to come back up extremely quickly or at a sloth like pace depending on conditions. In regards to the stoutness of the post, we’ve had no development of lateral play or any issue with the post sagging. It also does not seem to be very sensitive to seat collar tightness like some posts are. The lever that PNW provides has been surprisingly good as well. While not as refined as some shifter style levers, the “2x compatible” design operates the post smoothly and with a light lever feel. This is probably partially due to the lever itself and the activation mechanism on the bottom of the post. 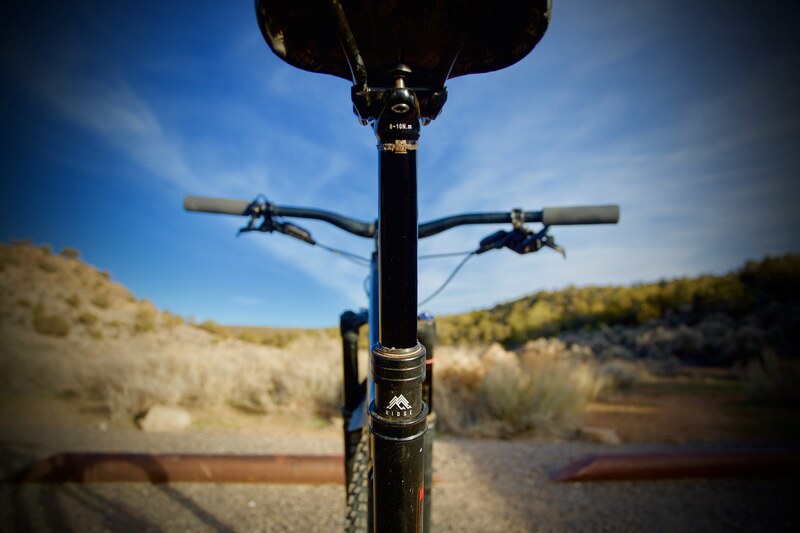 At this point we really have nothing but good things to say about this dropper and we’ve already been recommending it to people we meet on the trail. We’ll be continuing to use this post throughout the riding season and we’ll post a long term update. However, with a 3 year warranty I have no qualms about it’s durability. If you are looking for an affordable post that’s backed by a 3 year warranty from a U.S. based company, I would look no further than the PNW Ridge dropper. In fact, the current price on Amazon has now dropped to $139.00 making this dropper even easier on your pocket book. PNW provided a review unit for review.